Our one day stay in Panama City coincided with the first blows of Hurricane Otto that hit Central America at the end of November. If was overcast and raining most of the day. This post is about Panama City per se. For Panama Canal see the other post. The downtown and the apparently well-off neighborhoods by the beach with their ocean-view high-rises look quite modern and well planned. The skyline of the City as seen from the sea (see the featured image above) are quite impressive and reminescent of New York or Hong Kong. There are still slums here and there – these are ugly and non-descript, similar to those one can find in any big city around the world. The “touristy” parts of the Old Town are for the most part well restored and maintained, and are paved with red tile. In some places the remains of old Spanish churches stand next to modern buildings. The New Town is not too far away and its towers can be seen from the Old Town. The Presidential Palace occupies a small block in the Old Town. Surprisingly, one can see no security perimeter and no guards around it. It looks like Panamanians are not too paranoid about security. Some government buildings have almost imperial look, like the National Institute of Culture. Some parts of the Old Town are less well preserved, but it gives them a more genuine look. Many areas are under active reconstruction, which is another indication of emerging prosperity. The Metropolitan Cathedral of Panama was also under reconstruction. The National Theater could use some facelift too, and I hope it is going to be its turn soon. 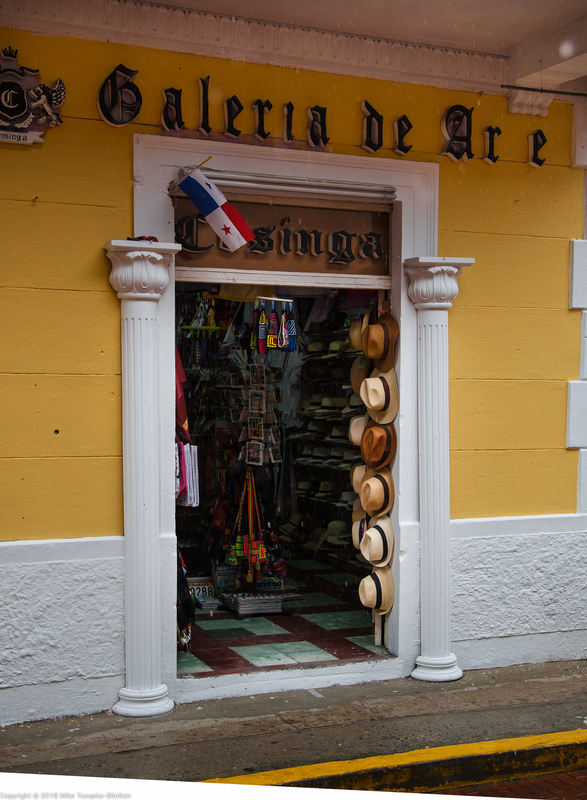 The boutiques and shops are everywhere, including Panama hat shops almost at every corner. Panama City. A beachwear shop. The beach promenade of the Old Town looked gray and sad under the tropical rain. But even under the rain the town felt hospitable and visitor friendly, and it made us wonder if maybe we should visit it again during a better season, and probably during some big holiday to check out the nightlife. Restaurants featuring all kinds of cuisine are ubiquitous in Panama City, especially in the Old Town. I liked Casa Blanca restaurant located in the former Hotel Colombia building at Plaza Bolivar (featured above).